Portal Settings allow you to set the desired Time Zone, Date & Time Format, Speed Units, Distance Units, Position Format, Number of Inbox Messages, Number of Recently Reported Devices on Dashboard, Track Line Style, along with some additional display preferences. Portal Settings are unique to your user profile and do not affect others. 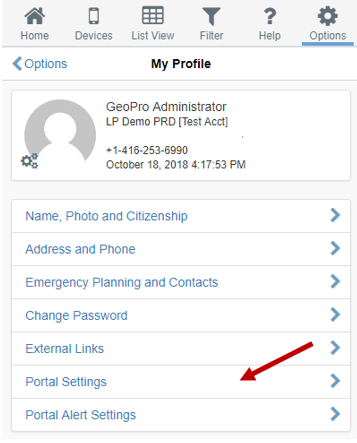 This article explains how to configure your profile's Portal Settings from the Options tab in the GeoPro Web App. 1. Navigate to the Options tab and select My Profile from the list. 2. Select Portal Settings from the list. Note: Users and Monitors are not presented with the Emergency Planning and Contacts option. This option is only available to Administrators. 3. Next, go through each of the items in the list and configure your settings as desired. 4. Press OK when finished to save your settings. You settings will now be reflected in the portal.